Click here for detailed dining room arm chair plans. This armchair will look well if made of plain-sawed oak. Quarter-sawed oak might be used, or black walnut if desired. The stock bill specifies the various parts mill-planed to size as far as possible. If you prefer to do your own surfacing, you should add 1/4 in. to the width of each piece, providing the stock is mill-planed to thickness. 2 front posts, 1-3/4 by 1-3/4 by 25 in., S-4-S.
1 piece for back posts, 1-3/4 by 6 by 43 in., S-2-S.
2 arm pieces, 7/8 by 4 by 24-1/2 in., S-4-S.
2 seat rails, 1 by 2-1/2 by 22 in., S-4-S.
2 seat rails, 1 by 2-1/2 by 24 in., S-4-S.
4 lower side rails, 5/8 by 1-1/2 by 22 in., S-4-S.
2 front and back lower rails, 5/8 by 2-3/4 by 24 in., S-4-S.
1 back rail, 3/4 by 2-1/4 by 24 in., S-4-S.
1 back rail, 3/4 by 2-1/2 by 24 in., S-4-S.
2 slats, 3/8 by 2 by 16-1/2 in., S-4-S.
1 slat, 3/8 by 4-1/2 by 16-1/2 in., S-4-S.
2 braces, 7/8 by 2-1/2 by 5-1/2 in., S-2-S. 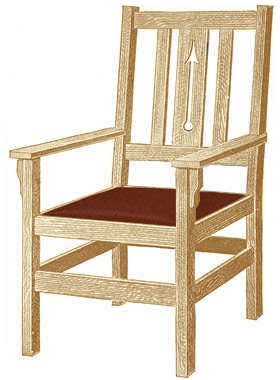 The design shown is for a chair in which the width of front and back is the same. Also the back leg parallels the front below the seat. In commercial practice the backs are usually made somewhat narrower than the fronts and the back leg is slanted somewhat below the seat as well as above. As this construction necessitates sloping shoulders on all tenons it complicates the problem when the work is not done by machinery. For mission effects the chair looks well with front and back the same width. Prepare the front posts first and then the rear. The rear posts are to be cut from the single piece of stock specified. By proper planning both pieces may be gotten out without trouble. 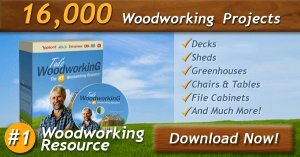 Lay off and cut the mortises. Saw the rails to length and lay out and cut the tenons. The back rails are to have mortises in their edges to receive the ends of the slats. Instead of  tenoning these slats make mortises large enough to receive the whole end—in other words, house the ends. Shape the two arms, then glue up the back and then the front of the chair. After the glue has set sufficiently, assemble the remainder of the parts. Thoroughly scrape and sandpaper the parts and then apply the finish. For a seat, either a leather cushion may be placed upon slats or the bottom may be upholstered in the usual manner, using webbing on heavy canvas, and then felt or hair with a top of canvas and leather; the whole being firmly fastened with tacks and the leather with ornamental nails.